← So… is there really a NEW PLANET? Nope! About a year and a half ago I ran across a guy in Grand Teton National Park who photographs the night sky using beautiful landscapes as the foregrounds for his “Nightscapes.” I was hooked and wanted to learn how to do that. When I got home to cloudy Ohio I took advantage of the rare clear nights and started learning how to go about it and also learning what it was I was seeing up there. At the time, all I really knew was the Big and Little Dippers, and that the Milky Way was our galaxy and that fuzzy streak you could see in really dark sky places. My interest in photography has helped me learn about the constellations and other objects in the sky. I’ve shot areas of the sky not knowing what was there, then I’d study the photos and find the constellations by looking at charts. There is so much up there and I find it all fascinating. On March 5-8 we spent some time in southern Ohio at Lake Hope State Park and also hiking around the various parks in Hocking Hills. It’s very dark out that way and we were fortunate enough to have two very clear nights and a clear early morning. Despite the very bright half-moon in the evenings you could see many things impossible to see in Parma. I have an app on my iPod called “Star Walk” and I can see what position the stars will be in on any given date and time so I knew the Milky Way would be visible in the southeast a couple hours before sunrise. I woke up one morning around 4:15 AM, looked out the window of our cottage, and could see Cygnus very clearly. So, I packed up my stuff and headed down by the lake and got my best shots to date of the Galactic Center, and a few other nice shots as well. Specs for the photo: Nikon D600, Nikkor AF-S 24-85mm f/3.5-4.5G ED VR, 20 seconds, f/3.5, ISO 6400. Processed in Lightroom 5.3 for Windows. 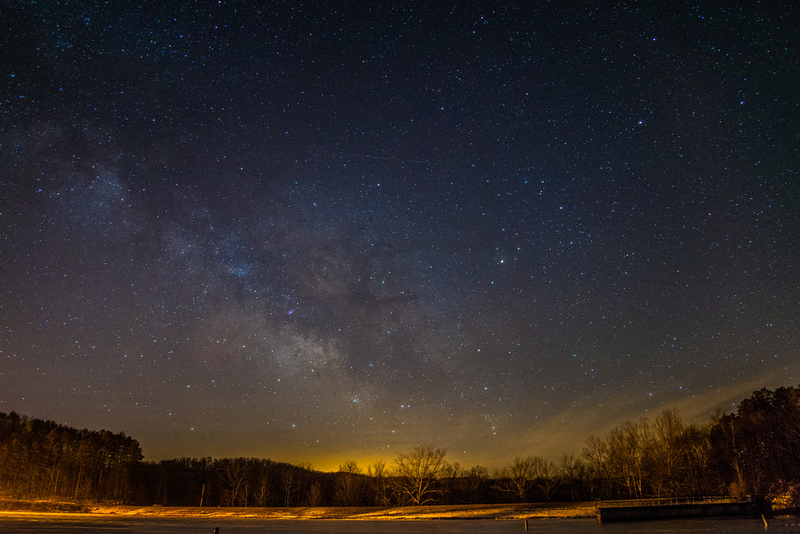 This entry was posted in Uncategorized and tagged astronomy, astrophoto, member photographs, Milky Way, northeastern ohio. Bookmark the permalink.